From classical Hollywood continuity editing to Eisensteinian montage, from the quick jump cuts of the French New Wave to the even more accelerated and spatially destabilized editing of the Hollywood blockbuster, filmmakers from the dawn of cinema have had to embrace, even if only on a subconscious level, some theory of editing. What, then, of today’s nascent medium of Virtual Reality (VR)? Some are calling VR the next phase of cinema, but many VR works are more akin to video games, where cuts are hidden within approaching horizon lines. Or where, inelegantly, an edit is simply a transition from one scene to another, artlessly throwing the viewer across time and space no matter which direction the headset is pointed. For their pioneers, the good thing about new mediums is that new theories and terminologies are there for the making. One filmmaker currently claiming mindshare with regards to VR editing strategies is Jessica Brillhart, who works in-house at Google on the Cardboard team. 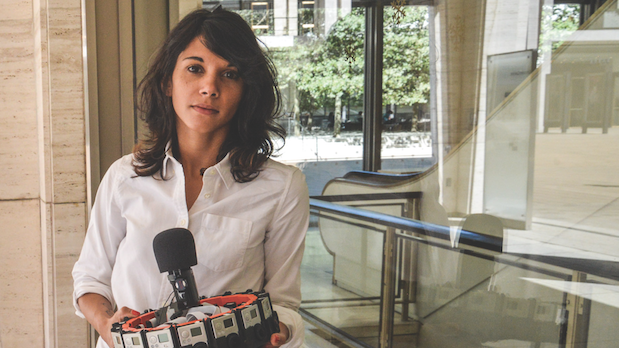 She most recently directed a short film, World Tour, for Google’s new Jump platform, and in the process developed what she is calling Probabilistic Experiential Editing, a concept that points to new ways to imagine montage in the VR age. Google Jump is a new platform combining hardware, cloud-based computing and YouTube. Using a rig like the GoPro Odyssey, which places 16 HERO4 camera modules pointing out from a perimeter of what looks like a hostess platter or film reel, Jump uploads those 16 channels of 4K video to the cloud, where they are stitched into seamless stereoscopic 360-degree VR video. That video is then delivered to YouTube, where it can be viewed in a VR headset, like Google’s smartphone-enabling Cardboard. Even at its anticipated price of around $15,000, the GoPro Odyssey, expected to be released in November, and Google Jump should, along with the forthcoming consumer release of Oculus Rift, ignite mainstream interest in VR. Directed by Brillhart to demonstrate the capabilities of the platform, World Tour is, as its title suggests, a globe-hopping journey from one striking environment to the other. But Brillhart has found subtle, surprising and sometimes poetic ways to carry the viewer from scene to scene. Although the cuts aren’t actually triggered by where you look, they nonetheless seem to anticipate your gaze. These are just the bare bones of Probabilistic Experiential Editing. “There’s the timing part, too,” Brillhart continues — “understanding how long and why we stare at something before it becomes too long. How much time do I need to reconcile a place before I decide that the Point of Interest is where I want to go?” As our conversation goes on, Brillhart and I discuss all the further possibilities of this concept of editing, from the role of sound and music cues to haptic responses to how even story and character can direct viewers toward Points of Interest that then seem to respond to their attention with a cut.